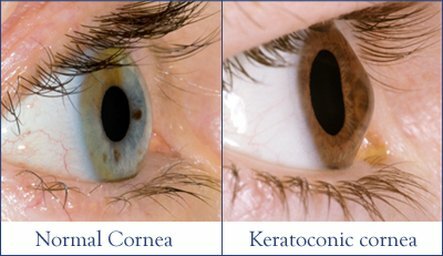 Keratoconus is the most common dystrophy of the cornea, affecting around one person in a thousand although some reports indicate prevalence as high as 1 in 500 individuals. It is typically diagnosed in the mid to late teens and attains its most severe state in the twenties an6d thirties. Proprietor Glen Ward has over 35 years experience as a qualified dispensing contact lens optician and specialises in fitting keratoconics. Symptoms can include substantial distortion of vision (astigmatism), with multiple images, blurry (near- and farsighted) vision and sensitivity to light (photophobia). Initially most people can correct their vision with glasses. But as the astigmatism worsens, most patients can be managed with specially fitted rigid gas permeable contact lenses to reduce the distortion and provide better vision. Proprietor and Contact Lens Optician Glen Ward has over 15 years experience improving the vision of patients with keratoconus. Symptoms may be unilateral initially and may later become bilateral. In 20% of patients, the condition is progressive and requires surgical intervention. These are clear, thin prescription inserts placed in the corneal periphery during a brief procedure. The rings act as scaffolding to the cornea providing support, and push out against the curvature of the cornea, flattening the peak of the cone and returning it to a more natural shape. The procedure carried out on an outpatient basis and offers the benefit of being reversible and even potentially exchangeable as it involves no removal of eye tissue.